Sling TV is the oldest and most popular streaming service currently available today. Their “al la carte” approach to cable TV is something that hasn’t been replicated by any other companies yet and helps them stand out in the sea of cable alternatives. Their popularity and success pushes device manufacturers to create native apps for Sling TV, ensuring that the service is available on almost everything. Not only is Sling TV supported by most major devices, they also have plenty of offers that will get you these devices for free if you pre-pay some number of months of your Sling TV service. It’s hard to argue with free stuff! Sling TV is a streaming service that offers live cable TV at a discounted rate. You can think of Sling TV as a “Netflix for live cable”. Unlike traditional cable, Sling TV doesn’t require much in terms of hardware and doesn’t lock you to a contract. It’s a month to month payment method and can be cancelled at any time without a cancellation fee. Since the service is internet based and doesn’t require coaxial cables or special proprietary hardware, you’ll also save money by not having to pay the expensive monthly hardware rental fees of cable providers. Sling can be viewed on a desktop, Smart TV, or mobile device but is also supported by most of the streaming devices currently available. We’ll discuss the hardware requirements later when we show you some of Sling’s hardware offers. Sling TV is one of the cheapest cord cutting options and also the most customizable. They offer two of the cheapest and smallest base packages on the market and then offer additional smaller packages you can add-on to personalize your channel line up. The base packages are Sling Orange and Sling Blue and cost $20 and $25 a month respectively. The base packages include a variety of popular channels (including some local news stations) totaling between 30 and 50 channels based on your location. The add-on packages include smaller channel line-ups that can add kid’s channels, movie channels, outdoor channels, sports networks, and more. To see a full list of Sling TV packages and their channel lineups, visit Sling.com. Make sure that you put in your location so that you know exactly which local stations you’ll get. Sling TV supports NBC, ABC, etc. but not for every location. Cutting the cord once and for all is a scary proposition. What if your service is buggy or lags and disconnects in the middle of an important game? Thankfully, most streaming services offer a trial period and Sling is no exception. As soon as you sign up for Sling TV you’ll be given a 7 day free trial. You do have to give Sling your payment information in order to sign up, but you won’t be billed for your first month until the 7 days are over. If the service isn’t what you expected and you’d like to cancel during this time, you won’t be billed at all. Before you sign up for the trial please note that you can’t use the trial if you’d like to take advantage of one of the device offers below. Most of the offers require you to pre-pay some number of months in order to qualify and doesn’t include a trial period. Take a look at the section below to see the device deals and determine if one of these offers is a better deal for you than the 7 day free trial. Once you decide on your Sling TV package (or packages), you’re going to want to actually start watching them. As we said above, Sling can be viewed on your mobile device, Smart TV, or computer simply by downloading a free app. But what if you wanted to watch it on a non-smart TV or a TV that doesn’t support the Sling app? The good news is that there are plenty of ways to do that too thanks to streaming devices. Before you purchase a device, you should be aware of the many offerings Sling has to get one for free. 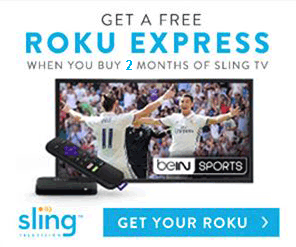 The Sling TV deal for a free Roku Express is one that we constantly recommend for first time cord cutters. Roku is one of the cheapest, simplest, and most reliable streaming devices on the market. They’ve been around almost as long as Sling and have continued to improve their already impressive products. Prepaying 2 months of Sling Orange will cost you $40 up-front. Since the Roku Express costs $29.99 if you buy it alone anyway, you’re only really increasing your initial cost by $10. If you were to use the Roku free trial offer and buy an Express, your initial out of pocket cost would be $29.99. 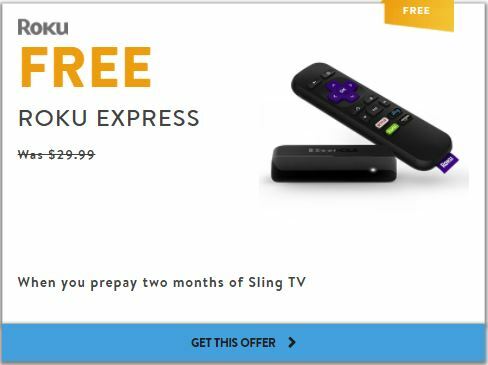 By taking advantage of the Sling Roku Express deal, you’ll get everything you need to watch Sling TV and save a total of $29.99. Note: This deal does not allow you to use the free trial offer. If you’re looking for a little bit more power than the Roku Express, the Roku Ultra is a little bit more money for a lot more power. Roku recommends using the Roku Ultra for your main television and then adding Roku Expresses or Streaming Sticks to secondary TVs. At $99.99, the Ultra isn’t just a no-brainer cheap upgrade compared to the Express. However, with only one extra month of pre-paying Sling, you can get the Ultra for half that price. 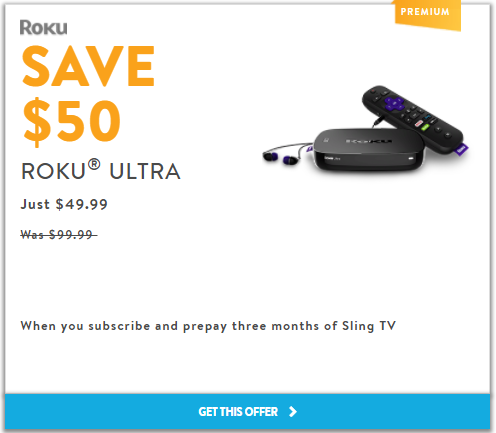 $110 for three months of Sling and a Roku Ultra is actually a really good deal; especially considering some devices, like the Apple TV, cost over $150 alone. The Roku Express deal gets you the device for free, but you’re actually only saving $30 total. With the Roku Ultra deal you’re saving $50 at the cost of a higher initial price. Note: This deal does not allow you to use the free trial offer. If you already have a standalone streaming device or your Smart TV is compatible with the Sling TV app, you might not need an additional device at all. That doesn’t necessarily mean there isn’t a deal you can take advantage of though. A lot of cord cutters use streaming services in addition to an over the air antenna to pick up additional channels and further reduce their bill. For example, Sling TV doesn’t carry CBS in any market areas. You can add CBS All Access to your Sling subscription for an extra $5.99, or you can use an antenna to pick up CBS for free. Antennas are incredibly location dependent though, so you might not be able to specifically pick up CBS. You are almost guaranteed to get some number of channels though no matter where you live. To determine which channels you can pick up with an antenna, we recommend using TVFool.com. Input your information into the required fields and hit submit. You’ll see a colorful results page with a lot intimidating tables, graphs, and data on it. To learn exactly what all of this information means and how to read your TV fool report in more detail, check out our How to get free cable TV article. For a quick look at your potentially receivable channels, look at the fourth column from the left (titled Netwk) in the colored table. 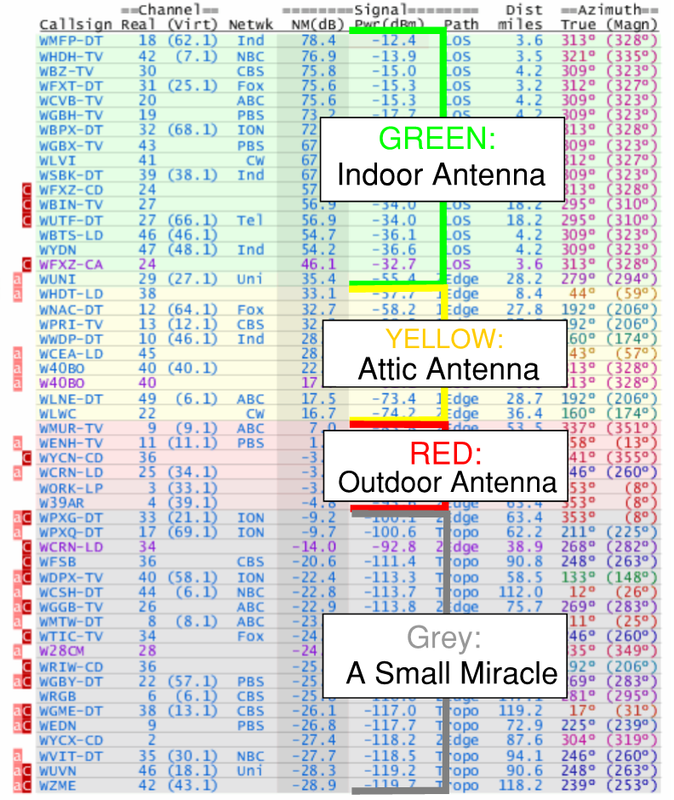 Take note of the network name and color and use the image below to figure out which type of antenna you may need. 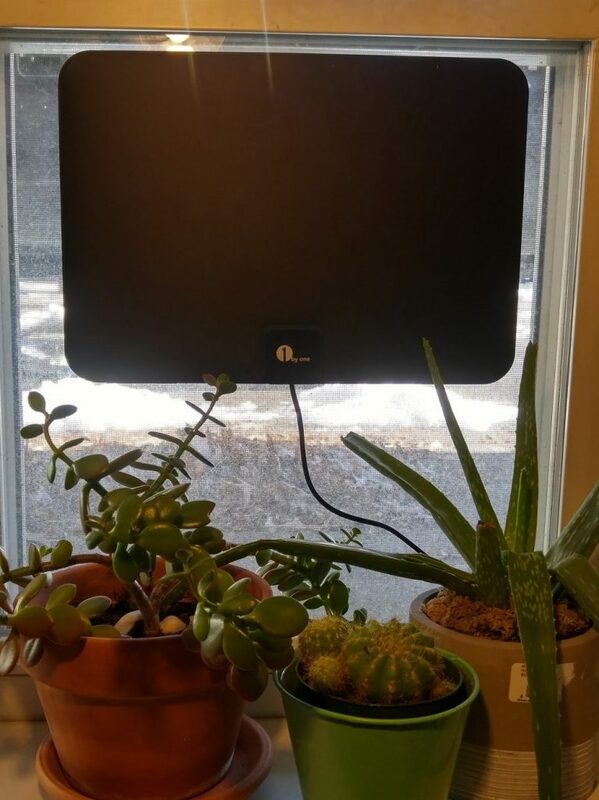 The antenna that is included with the Sling TV deal is an indoor antenna and should be able to receive most green networks and an occasional yellow one. If most of your channels are yellow and you’d like an antenna, we wrote a guide on the best attic TV antennas that can help you out. Note: This deal does not allow you to use the free trial offer. If you’d rather not use a Roku and still need a streaming device, Sling TV also offers a discount on an AirTV Player. Rather than rely on 3rd parties to build and market streaming devices, Sling decided it was time to launch their own. 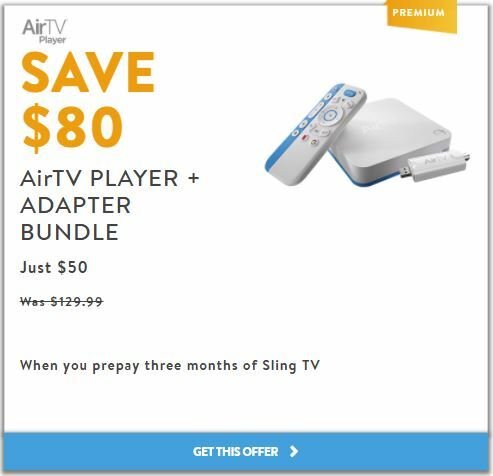 It’s not clear if the AirTV is meant solely to attract Sling subscribers or if AT&T plans to compete against Roku and the other hardware giants. Either way, the discount is pretty good and so is the hardware. The AirTV is similar to a Roku, but with a few noticeable differences. The first major difference is how much the AirTV stands out in the sea of little black boxes that is streaming hardware. With its white base color and blue highlights it’s hard not to notice the AirTV. The other, and most imporant, is its support for over the air channels. The adapter (included in the discount bundle) allows you to plug in your antenna and stream your live cable stations directly onto your AirTV Player. The only way to do this with the other streaming devices is to purchase an additional device like an HDHomeRun. Keeping it on the same device allows you to seamlessly switch between your Sling stations and over the air channels without having to swap apps and interfaces. Whether or not this makes the AirTV the right choice is up to. Frankly, we recommend going with the Roku. Note: This deal does not allow you to use the free trial offer. 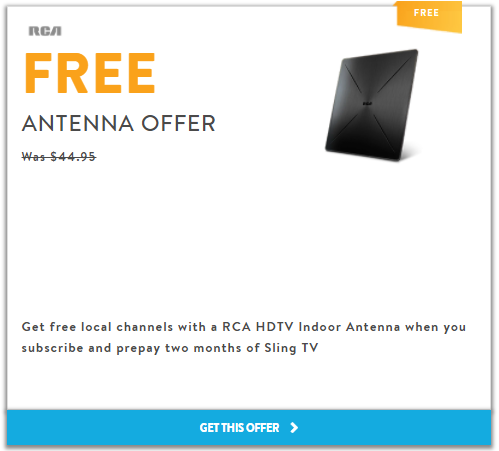 This deal is incredibly similar to the one above with the added benefit of not having to get your own antenna. However, that isn’t a very good reason to get this package. You can get some really high quality indoor TV antennas for cheap that will likely perform a lot better. Although the convenience of not having to order an additional product is nice, Amazon makes ordering things quite easy. 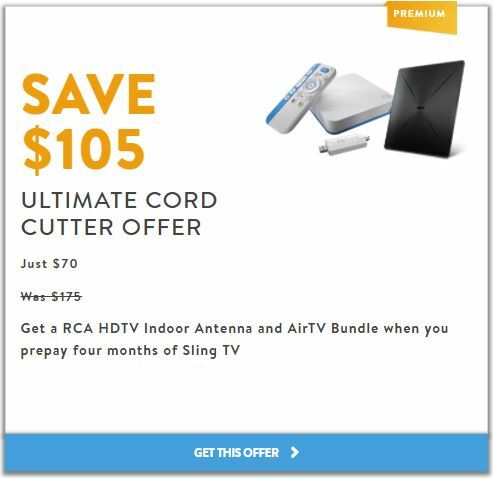 We recommend not choosing this offer and if you want an AirTV, get the AirTV bundle and order your own antenna. If you don’t want to read our full indoor antenna guide, our recommend antenna is below. It’s a bit more expensive than $20, but not by much and you’re guaranteed to get a product that’s worth it. Note: This deal does not allow you to use the free trial offer. Sling TV device offers are fantastic, but that’s not the only place you can save. There are plenty of Sling deals once you already have a subscription that will give you discounts on their addon packages. While Sling Orange and Sling Blue are great in their own right, the addon packages are what makes Sling truly stand out among the cord cutting crowd. To activate these coupons, go to your account settings and select “Redeem Promo Code”. Then, all you have to do is enter the promo code and the discount will be applied to your account. This code can be used on any of the three following packages: Hindi Mini, Tamil Mini, and Telugu Mini. Each of these packages typically costs $5 a month. The code is equivalent to four months of any one of these packages. If you’re specifically looking for a year of one of the above addon packages, using these promo codes will save you $50. If you’re not willing to sign up for a year, the previous promo code might be better.